Thurmont Town Hall is located at 615 East Main Street, Thurmont, MD 21788; phone: 301-271-7313. Photo: John Eyler Farmstead, ca. 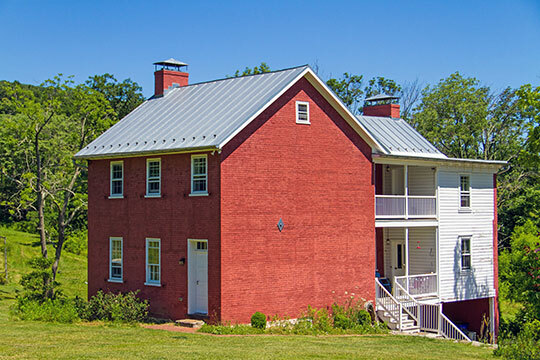 early 1800s, 7216 Eylers Valley Flint Road, Thurmont, MD. Listed on the National Register of Historic Places in 2006. Photographed by User:Curtis.w.wright (own work), 2014, [cc-by-3.0 (creativecommons.org/licenses/by/3.0)], via Wikimedia Commons, accessed January, 2016. The Thurmont area was first settled in the late eighteenth century by German immigrants who found the forests, fertile soils, and plentiful water ideal characteristics for establishing a new community. The village center was laid out sometime around 1803 by the Creager family centered around the intersection of the main north-south and east-west routes (MD 806 and MD 77 respectively). The Wellers, a family of German immigrants, were also influential in the early development of the village which soon became known as Mechanicstown due to the number of blacksmiths and mechanics who worked in the area. Mechanicstown supported a number of industries including an edge tool factory, a woolen mill, tanneries, and a match factory—America's first to produce friction matches. Mechanicstown was incorporated as a municipality in 1832. In 1871, the Western Maryland Railroad came to town and with it came an infusion of industries and associated development. These new industries included a cannery, a weaving factory, and manufacturer of cigars. The railroad also brought summer visitors from Baltimore who stayed at the several hotels and inns built in town. In 1894, the name Mechanicstown was officially changed to Thurmont—a combination of French and Germanic word fragments roughly translated as "through the mountains." This name change came about as the result of confusion between several places in America called Mechanicstown, Mechanicsville, and Mechanicsburg. Although the moniker 'Blue Mountain City' was the first choice among residents at the time, the local postmaster vetoed the choice due to its length. Another major influence on Thurmont's growth and development was the construction of the Hagerstown and Frederick (H&F) Railroad—an electric trolley line providing freight and passenger service to Hagerstown, Frederick, Myersville, and Middletown. The line operated its last train in 1954. Although neither railroad station remains standing, the right-of-way for the H&F railroad forms the basis of a new and developing transportation asset in Thurmont. The Thurmont Trolley Trail—a multi-use facility—connects the downtown area with the new regional library on Moser Road. Since the end of the Second World War, Thurmont has become less of an agricultural center and more of a commercial and residential center within northern Frederick County. Although Thurmont's role as an agricultural center has declined since the late 1940's, the Town maintains a strong link to the farming community as evidenced by the growth and popularity of the annual Thurmont/Emmitsburg Community Show, the seasonal Farmer's Market, and a strong Future Farmers of America (FFA) program in the local schools. The Town continues to support several mid-sized industries situated along the railroad and, due to its proximity to State and Federal parklands, also supports tourism activity linked to outdoor recreation. As the closest full-service community to the nearby presidential retreat known as Camp David, the Town of Thurmont also occasionally finds itself serving as the staging point for national or international events as well as for the media outlets that follow such activities closely. Thurmont Planning and Zoning Commission, Thurmont Master Plan: A Community Vision for 2010 and Beyond, www.thurmont.com, accessed January, 2016.